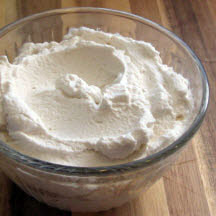 This is a recipe for sweetened whipped cream that stays whipped! The secret is using both granulated and powdered sugar in equal proportions. This is the perfect "make-ahead" whipped cream for whatever, whenever and however you want to use it. Combine all ingredients in a small mixing bowl and beat on high until stiff, about 2 to 3 minutes. Cover and refrigerate until ready to use. Makes 2 cups whipped cream. Tip: Try other extract flavors, such as mint or rum, that will complement the dessert being served..